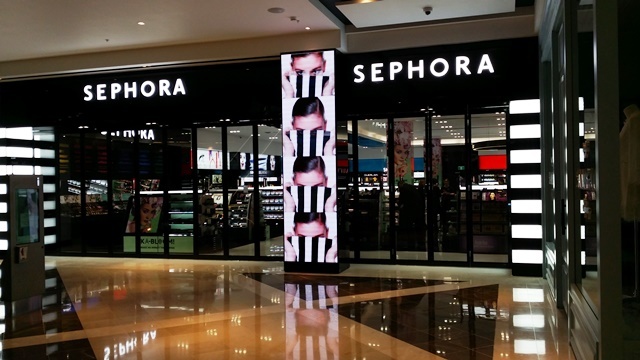 Mirage Doors has recently completed the supply and installation of a Fiesta stacking door for the new Sephora shop in Macquarie Centre, North Ryde. 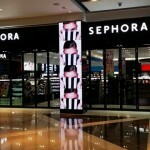 As an upmarket retail brand, Sephora wanted a high end shopfront to reflect their image. The Fiesta spans an impressive 11 metres wide and 3 metres high. During trade, the door stacks off to a side closure via a 90 degree chicane track system. When in the closed position, store access is made possible by a single egress door. Each panel consists of 6.38mm laminated glass encased in an aluminium frame, powder coated in a Satin Black. The Fiesta door is made to order and can be customised to suit individual customer needs and any shop front size.